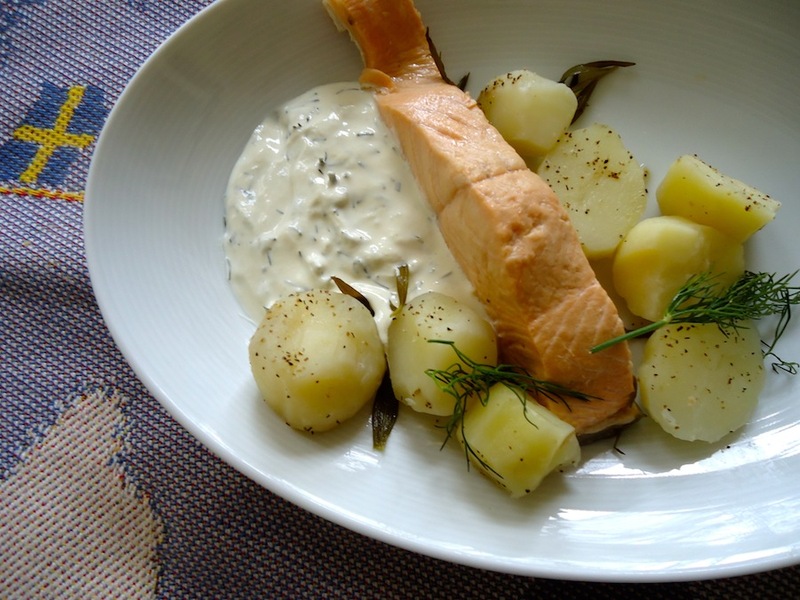 In Sweden, this poached salmon is traditionally served cold with steaming potatoes…cold and warm flavors mixing beautifully, good reminders of long Scandinavian winters and of short midnight sun summers. Combine all ingredients in a pan, boil it 10 to 12 minutes at medium heat. Let it cool out of the heat for 1 hour to up one night. Combine all ingredients, mix well, refrigerate for at least 1 hour. Before serving, boil at tenderness some gold yukon potatoes. When warm add on each plate a serving of poached salmon, a dollop of creamy dill sauce, potatoes, a tablespoon of lingonberries if you like it( in grocery stores). Enjoy friends, it’s simply Delightful , Utsökt gott!! !